Poop could be a goldmine — literally. Surprisingly, treated solid waste contains gold, silver and other metals, as well as rare elements such as palladium and vanadium that are used in electronics and alloys. Now researchers are looking at identifying the metals that are getting flushed and how they can be recovered. This could decrease the need for mining and reduce the unwanted release of metals into the environment. A talk about their recent work will be one of nearly 11,000 presentations here at the 249th National Meeting & Exposition of the American Chemical Society (ACS), the world’s largest scientific society, taking place here through Thursday. “If you can get rid of some of the nuisance metals that currently limit how much of these biosolids we can use on fields and forests, and at the same time recover valuable metals and other elements, that’s a win-win,” says Kathleen Smith, Ph.D.
“There are metals everywhere,” Smith says, noting they are “in your hair care products, detergents, even nanoparticles that are put in socks to prevent bad odors.” Whatever their origin, the wastes containing these metals all end up being funneled through wastewater treatment plants, where she says many metals end up in the leftover solid waste. Microscopic gold-rich and lead-rich particles in a municipal biosolids sample. Credit: Heather Lowers, USGS Denver Microbeam Laboratory. At treatment plants, wastewater goes through a series of physical, biological and chemical processes. The end products are treated water and biosolids. Smith, who is at the U.S. Geological Survey (USGS), says more than 7 million tons of biosolids come out of U.S. wastewater facilities each year. About half of that is used as fertilizer on fields and in forests, while the other half is incinerated or sent to landfills. Smith and her team are on a mission to find out exactly what is in our waste. “We have a two-pronged approach,” she says. “In one part of the study, we are looking at removing some regulated metals from the biosolids that limit their use for land application. “In the other part of the project, we’re interested in collecting valuable metals that could be sold, including some of the more technologically important metals, such as vanadium and copper that are in cell phones, computers and alloys,” Smith said. To do this, they are taking a page from the industrial mining operations’ method book and are experimenting with some of the same chemicals, called leachates, which this industry uses to pull metals out of rock. While some of these leachates have a bad reputation for damaging ecosystems when they leak or spill into the environment, Smith says that in a controlled setting, they could safely be used to recover metals in treated solid waste. So far, her group has collected samples from small towns in the Rocky Mountains, rural communities and big cities. For a more comprehensive picture, they plan to combine their information with many years’ worth of existing data collected by the Environmental Protection Agency and other groups at the USGS. In a recent Environmental Science & Technology paper, another research group also studying this issue calculated that the waste from 1 million Americans could contain as much as $13 million worth of metals. That’s money that could help fuel local economies. Light behaves both as a particle and as a wave. Since the days of Einstein, scientists have been trying to directly observe both of these aspects of light at the same time. Now, scientists at EPFL have succeeded in capturing the first-ever snapshot of this dual behavior. Quantum mechanics tells us that light can behave simultaneously as a particle and as a wave. However, there has never been an experiment able to capture both natures of light at the same time; the closest we have come is seeing either wave or particle, but always at different times. Taking a radically different experimental approach, EPFL scientists have now been able to take the first ever snapshot of light behaving both as a wave and as a particle. The breakthrough work is published in Nature Communications. When UV light hits a metal surface, it causes an emission of electrons. Albert Einstein explained this “photoelectric” effect by proposing that light – thought to only be a wave – is also a stream of particles. Even though a variety of experiments have successfully observed both the particle- and wave-like behaviors of light, they have never been able to observe both at the same time. A research team led by Fabrizio Carbone at EPFL has now carried out an experiment with a clever twist: using electrons to image light. The researchers have captured, for the first time ever, a single snapshot of light behaving simultaneously as both a wave and a stream of particles particle. The experiment is set up like this: A pulse of laser light is fired at a tiny metallic nanowire. The laser adds energy to the charged particles in the nanowire, causing them to vibrate. Light travels along this tiny wire in two possible directions, like cars on a highway. When waves traveling in opposite directions meet each other they form a new wave that looks like it is standing in place. Here, this standing wave becomes the source of light for the experiment, radiating around the nanowire. This is where the experiment’s trick comes in: The scientists shot a stream of electrons close to the nanowire, using them to image the standing wave of light. As the electrons interacted with the confined light on the nanowire, they either sped up or slowed down. 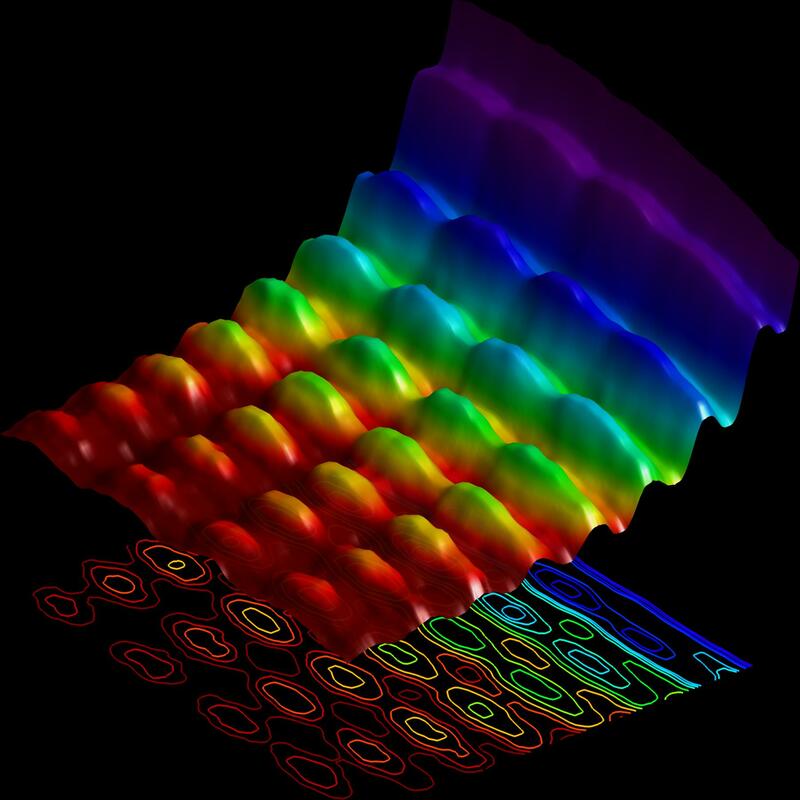 Using the ultrafast microscope to image the position where this change in speed occurred, Carbone’s team could now visualize the standing wave, which acts as a fingerprint of the wave-nature of light. Energy-space photography of light confined on a nanowire, simultaneously shows both spatial interference and energy quantization. Credit: Fabrizio Carbone/EPFL. While this phenomenon shows the wave-like nature of light, it simultaneously demonstrates its particle aspect as well. As the electrons pass close to the standing wave of light, they “hit” the light’s particles, the photons. As mentioned above, this affects their speed, making them move faster or slower. This change in speed appears as an exchange of energy “packets” (quanta) between electrons and photons. The very occurrence of these energy packets shows that the light on the nanowire behaves as a particle.